« three times your valentine! 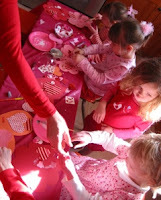 Four little girls and two little boys joined Ava for an hour or so of Valentine fun. My friend Jennifer captured the sweetness of our morning with this slide show that she created for her own blog. Thank you Jennifer for making this and letting my post it here too. Wow! You throw a great party! I’m glad you got to come to ours, with your obviously heavy social schedule. 🙂 Hope to see you soon…I’ll probably keep my boots on, in case of sharks. I was wondering how the party went! It looks like it was a bunch of fun!